Free portable software SCODIAC v.2.4 for Windows to download as ZIP file. Free installation software SCODIAC v.2.4 for Windows to download as ZIP file. The original version with the name AngleSpine was renamed to SCODIAC = SCOliotic DIAgnostiCs. Assessing the extent of a rotation of a spinal segment on a transversal plane is difficult. Many methods have been proposed and employed to measure vertebral rotation such as radiography, CT, MRI methods and ultrasound. However these methods do not display a close correlation nor do they reproduce the actual and known values of the thoracic or lumbar vertebral rotation. The objective of this study is to present a new radiographic method for the assessment of vertebral rotation from an antero-posterior (AP) view of conventional X-rays which is sufficiently precise in comparison with radiographic methods presently used in clinical practice (methods of Nash-Moe and Perdriolle). This method is based on the properties of the geometric shape of vertebrae and their shared dimensional proportions. It means that the relation between vertebral body width and height does not change significantly within the entire thoracic and lumbar sections of the spine. 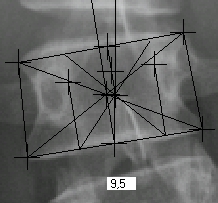 The absolute size of the angle of vertebral rotation is measured on X-ray film. In order to verify the method, we have constructed a special device for vertebral fixation (in vitro) with the possibility to obtain X-ray films with a predefined rotation. Results. Subsequently, the X-ray pictures of individual human vertebrae with predefined rotation values (ranging from 0 to 45 degrees by steps of 3 degrees) were radio-graphically measured and then compared with their actual axial rotation on the vertebral rotation device. All arithmetic averages correlate very closely with the actual values. A published X-ray picture with defined rotational values was read utilizing both our new method and a Perdriolle torsion-meter and the acceptable accuracy of our method was verified. The verification of axial vertebral rotation with the assistance of CT and MRI pictures of six scoliotic patients (in supine position) and the evaluation of axial vertebral rotation by both the new radiographic method and with the Perdriolle method proved the satisfactory accuracy of our method. Conclusion. The main advantage of the newly presented radiographic method is the uncomplicated measurement of vertebral rotation from AP projection of conventional X-ray pictures or from its printed copies. The absolute size of an X-ray picture or its copy is unimportant. The gold standard of the new radiographic method is the evaluation of axial rotation of vertebrae to 30 degrees approximately and the shape of vertebral bodies without severe structural deformities. The new radiographic method seems to be suitable for use in clinical practice.